For a country whose inhabitants are primarily city-dwellers, wildlife has always loomed large in the American imagination. Roaming bison, howling wolves, and swooping bald eagles are all images we’re all accustomed to — despite rarely (if ever) encountering such creatures in the wild. Although my upbringing in the Rockies allowed me glimpses of extraordinary animals, my portfolio of work as an aspiring childhood wildlife photographer was disappointingly second-rate. My pictures lacked narrative and wonder. I was, however, an expert at capturing bear butts and blurry moose — and my knack for wasting roll after roll of my dad’s film was impressive. Over a decade later, technology has enabled more people to capture incredible images. I was given the opportunity to redeem myself of my childhood errors by trying out a new top-of-the-line camera. Equipped with Canon EOS 5D Mark IV DSLR cameras, my coworker Steven Polletta and I were to venture to Colorado to capture scenes of the Great American West and its fauna. But we wanted to do it the right way: by soliciting advice from experienced wildlife photography pros. We called up Clay Bolt, a natural history photographer whose work has been featured in National Geographic and BBC Wildlife (among many others), and Jeff Kerby, an arctic and alpine biologist-photographer and National Geographic Explorer who uses his images for both research and storytelling. Bolt and Kerby specialize in very different subject matter — Bolt’s focus is on macro and close-up photography of invertebrates, reptiles, and amphibians, while Kerby combines two discrete practices: using a traditional sit-and-wait approach to photograph large herbivores, and flying drones equipped with multispectral cameras to capture landscapes from above. Likewise, Kerby — a biologist himself — captures many of his photographs while researching in the field. Both photographers emphasized capturing the surrounding environment in addition to the wildlife to give viewers contextual information. Both photographers also stressed the need for serendipity and patience. Bolt highlighted the importance of watching and waiting for a while to show animals that you’re not a threat, thereby eliciting more natural behavior. “If you rush it, you may get something that looks good to you but freaked out to a biologist, which means that it’s not going to get published in National Geographic likely because the animal is totally spooked,” Bolt explained. As for technical tips, Bolt recommended experimenting with untethering automatic settings, starting out by shooting landscapes in aperture priority mode. Kerby recommended slightly underexposing photos when in doubt, as more information can be pulled from darker pixels. Kerby also suggested an app called Sunseeker, which tells you exactly where the sun is going to be (and thus when the light will be beautiful), as well as geotagging your photographs for precise record-keeping. Armed with an abundance of excellent advice, Steven and I staked out in several locations on the East side of Rocky Mountain National Park over the course of two days. 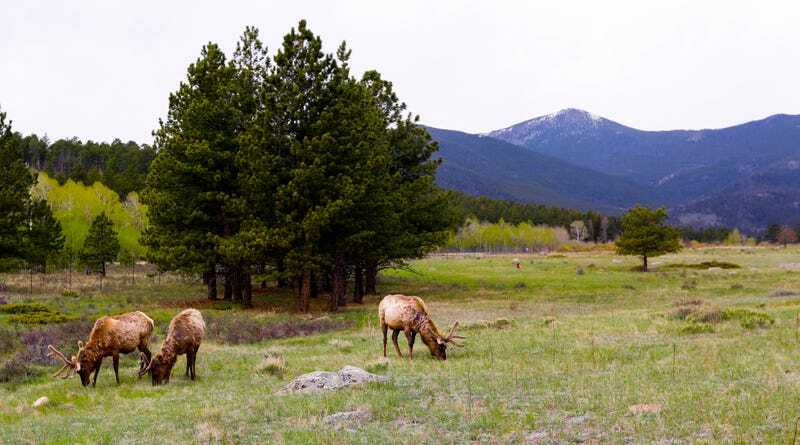 Our research told us that elk feed where meadow meets forest during dusk and dawn; bighorn sheep, on the other hand, are active and more likely to descend to lower elevations during daylight hours. In spite of carefully selecting sunny days, an unpredicted cold front moved in, with overcast skies casting a flat light during much of our time. Still, our Canon EOS 5D Mark IV DSLR cameras and lenses performed exceptionally well. Features like 7 fps continuous shooting and 30.4 megapixels full-frame CMOS sensor allowed us to photograph a surprising array of scenes even under suboptimal conditions, capturing emerging marmots, elk feasting on dandelions, mule deer chomping on shrubs, and preening magpies. There was even more that we glimpsed but didn’t capture: a bighorn ewe seen through binoculars, a water dipper flitting in a stream, turkeys ambling through forest, a magpie casually perched atop a bull elk.